She beckoned to us from the shadows cast by the sculpted posts filled with symbolism the meaning of which now escapes me, there in that structure that represented religion in Taiwan. “Come, come. I want to introduce you to some gods.” Or at least that is what I heard local guide Jane Fan told our group from Cebu that joined the AirAsia Taiwan trip amid the babel of languages that merged with worship sounds within the Longshan Temple in Taipei. This religious structure in Taipei City’s Wanhua District is a rarity in that it is used by Tao and Buddhism followers, a fact that Jane shared with our small crew of mostly first-timers in Taiwan. AMIE TEA HOUSE. The restaurant it up as dark clouds and fog rolled into the old gold mining town. Caught between the desire to linger in some areas and follow Jane’s pace, I did manage to catch some snippets of information about Longshan Temple in particular and worship in general in Taiwan. In temples, you have to enter through the dragon path and exit through the tiger path. If you want to know why, I unfortunately missed that part. When you go up the temple steps, you have to do so with body bowed as a form of respect. I lost count of how many deities are worshipped in Longshan but I learned there are halls or altars to the sea goddess Matsu, the gods of literature and war, matchmaking god, god of childbirth (with its hall filled with flower offerings), and the main temple goddess of mercy and compassion Guanyin. The Presidential Office Building. There are only a few days a year when they open the Presidential Office Building to the public. From our guide, I also found out that when Buddhism made its way from India to China during the Han Dynasty in the third century, Guanyin was male but the Han Chinese made her female because they believed this was more in keeping with the attributes of mercy and compassion. The Taiwanese are descendants of the Han Chinese who followed Chiang Kai-shek when he retreated to Taiwan following the defeat of his Nationalist’s party by the Communist Party of China in 1949. JIUFEN. Formerly a gold mining district located in a mountainous area of the Ruifang District in New Taipei City, Jiufen was once a prosperous and booming town that earned for it the nickname “Little Hongkong.” That was during the discovery of gold in the area during the Japanese occupation of Taiwan in the late 1800’s. Our trip was brief but we managed to go to as many places as humanly possible, thanks to our guide and to the early AirAsia Cebu-Taipei flight schedule. We left Cebu at 6:10 a.m. of November 25, 2016 on the Philippines AirAsia inaugural flight and arrived at the Taoyuan International Airport in Taiwan 25 minutes ahead of schedule. That trip marked the start of AirAsia’s thrice weekly flights to Taipei from Cebu. The Golden Waterfall, where the mixture of rainfall and heavy metal elements in the riverbed lend it a yellowish sheen. It was more dull copper during our visit and may be golden some other times. Before Longshan Temple, we checked out the Presidential Office Building from a vantage point across the street and the Chiang Kai-shek Memorial Hall built in honor of Taiwan’s first president. Since there are only a few days a year when they open the Presidential Office Building to the public, we have to be content with admiring from afar this sprawling Baroque structure that, for all its western influence, seems fittingly at home in Chinese Taipei. Travel is never complete without shopping or food so off we went to the Ximending Commercial District that reminded me somewhat of Cebu City’s Colon Street sans all the dirt and pickpockets. What can I tell you about Ximending? It is long stretches of parallel and intersecting streets lined on both sides with small and big stalls, two-level stores, and malls selling everything from fruits and food to electronics and fashion retail of local and top brands. Some streets or at least the one I’ve walked on are cobbled and filled to the brim with shoppers, tourists, ambulant vendors, and the occasional stray vehicle. LONGSHAN TEMPLE. Our group from Cebu at the entrance to Longshan Temple, a rarity since it is used by both Tao and Buddhism followers, our guide told us. It was on a Ximending street where I had my first official encounter of the popular local delicacy stinky tofu. A pungent odor a mile away preceded this introduction and it was probably a good thing that we didn’t carry through with our dare to eat some and document our daring on Facebook Live no less. First day lunch was at the highly acclaimed and original branch of the xiao long bao restaurant chain Din Tai Fung in Taipei. It only took us 40 minutes to get a table and we used the time wisely to get some milk tea from 50 Lan, reportedly one of the best sources of the drinks in the city. Jane tried to provide as much variation in dining as she can in two days and brought us for dinner to a cavernous restaurant with its bizarre architecture and artwork. Artist Hsieh Li-shiang is the person behind the Five Cent Driftwood House concept. The Chiang Kai-shek Memorial Hall was built in honor of Taiwan’s first president. The second day of our trip was spent food tasting in Jiufen. Formerly a gold mining district located in a mountainous area of the Ruifang District in New Taipei City, Jiufen was once a prosperous and booming town that earned for it the nickname “Little Hongkong.” That was during the discovery of gold in the area during the Japanese occupation of Taiwan in the late 1800’s. Today, the town is a maze of alleyways filled to the brim with shops and tourists. Local merchants sell food, souvenirs, clothes, bags, and whatnots. DIN TAI FUNG. It took us 40 minutes to get a table at the original branch of this xiao long bao restaurant chain. Food stalls usually have sample of their products in containers for tasting. Our guide had to caution us not to eat too much from the free samples as we were headed to lunch. Despite Jane’s admonition, I was tempted to try out several items. My favorite food in Jiufen was the peanut and ice cream roll, which was a combination of two scoops of ice cream on a bed of grated peanut brittle that was garnished with coriander before being wrapped inside a spring roll. Heavenly! Second day side trips include ones made to the Nanya Rock Formation, Bitou Cape, and Golden Waterfall where the mixture of rainfall and heavy metal elements in the riverbed lend it a yellowish sheen. It was more dull copper during our visit and may be golden some other times. For lunch, we skipped the more popular Amie Tea House and took ours at the Skyline Tea House. We had a ready table so we didn’t have to wait. From our perch, we had this unobstructed view of Amie and witnessed the restaurant light up as dark clouds and fog rolled into the old gold mining town. The pictures turned out perfectly, too. 50 LAN. We were told that this shop serves one of the best milk teas in Taiwan. Our last big stop was Taipei 101 or the Taipei World Financial Center because one simply doesn’t miss out on this iconic skyscraper in the heart of the city. I listened to my ears pop as we rode the pressurized elevator from the 5th floor to the Indoor Observatory at the 87th floor in a matter of 40 plus seconds. They dim the elevator so you can look up as constellations form out and shooting stars streak across the make-believe sky on the elevator ceiling. 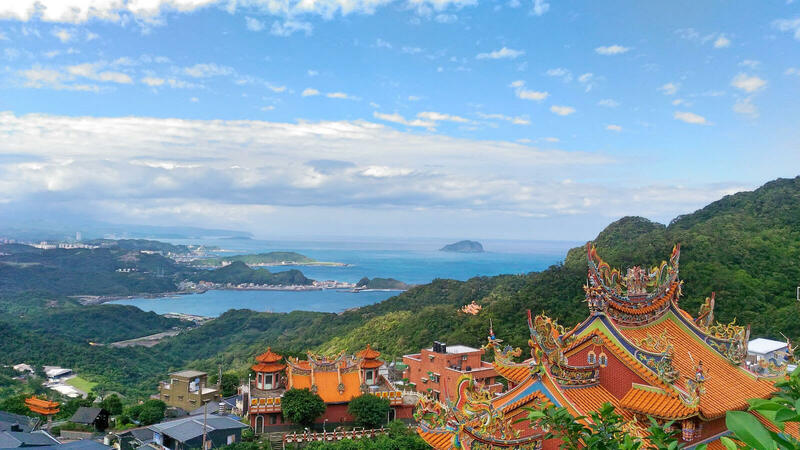 There is so much to love in Taiwan and one visit is simply not enough. And that is why I’m returning this January on a Philippines AirAsia flight to Taipei. This time around, I intend to take my time. FIRST PRESIDENT. A wax replica of Chiang Kai-shek, Taiwan’s first president.